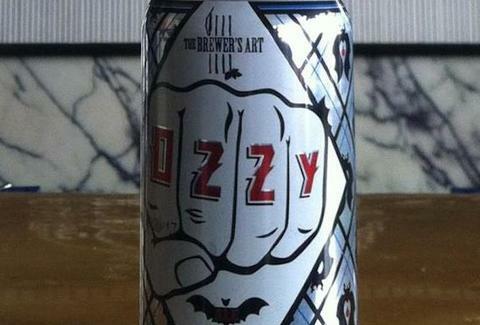 Ozzy Osbourne was apparently paranoid over a beer named in his honor. The noted biter of bats and mumbler of expletives filed a cease-and-desist order against Baltimore's Brewer's Art earlier this month over their Ozzy beer, demanding they change the name of their Belgian-style ale. For those of you keeping score, this is coming from the man who has lent his name to Best Buy, Pepsi, and, even, I Can't Believe It's Not Butter... and peed on the Alamo. Brewer's Art has been brewing Ozzy for several years now and has a devoted fan base, so they naturally turned to their customers for a new name once the Prince of Darkness brought the hammer down. The crowd spoke, and the beer was rechristened Beazly, a reference to the brewery's long-time bartender Mark Barcus. We're not sure how Barcus earned that nickname, but if he's anything like the beer's first namesake, it might mean there are some headless bees behind his bar. Kristin Hunt is a food/drink staff writer for Thrillist and will be accepting any bootleg Ozzy beer cans before they make the official switch. Follow her at @kristin_hunt.